Although it was published some years ago, an analysis of this un-putdown-able novel was recently featured in The Guardian newspaper's Saturday 'Review'. Dunmore really gets you inside what it must have been like to be an inhabitant of Leningrad during the first, horrific winter of its 900 day siege by German forces during WW II. Although the author is not herself Russian, you feel completely immersed in Russianness. We follow the struggle for survival of Anna and her constant care for her young brother Kolya; her ailing, war-wounded father, Mikhail; and her father's long-standing friend and one time mistress, the actress Marina - a non-person as far as the regime was concerned and therefore dangerous to know. The story begins with life in the city shortly before Operation Barbarossa, the unforeseen German onslaught that broke the Hitler-Stalin pact. We live the everyday life of scouring the city and queuing for food at the first rumour of something extra in stock; the acceptance that the party elite have a parallel, privileged existence; the pleasures of the countryside and its opportunities for foraging and growing one's own vegetables; the constant need to guard one's tongue for fear of being denounced to the authorities as a spy, saboteur or Trotskyite, even if out of jealousy for having a bigger apartment... And the fear heightened by Mikhail's being a writer who has a history of failing to toe the party line. 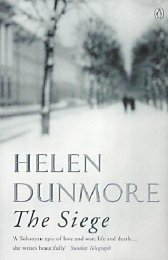 Dunmore vividly depicts the seasons on the river Neva, Lake Ladoga and surrounding marshes where Peter the Great chose to site his new city of St Petersburg - the joys of winter, in spite of the cold, the anxious wait for the spring... All now marred by the onset of the German invasion and the need first to evacuate the children - a nightmare of organisation in the face of the constantly swelling number of refugees and the bombing of the railways before the net finally closes on the half-completed task. And Kolya stays. And then there's the friend turned enemy - a Leningrad winter and the bone-chilling cold of semi-starvation in an unheated apartment. Anna's quest for a wood-burning stove unveils the sordid lives of speculators and the worthlessness of valuables against the need for warmth and bread. Even the furniture and books have no value except as fuel for the stove. In the background, the battle against the German forces rages on. Anna's hands were raw from digging trenches and tank traps; her new-found friend, Andrei, in the thick of it as a medical student trying to cope with exhaustion, lack of food and the constant flow of casualties - and his burgeoning relationship with Anna. Tempted as I am, I won't spoil the story by further commentary. Read it for yourself. You'll be well rewarded!